Cardiff Blues boss Dai Young has revealed that their Heineken Cup victory over Harlequins has come at a cost with four players picking up injuries. Lock Paul Tito was pole-axed after an attempted tackle on Quins centre Gonzalo Tiesi that caused a seven-minute stoppage before he was stretchered off. Fellow second row Bradley Davies, meanwhile, followed Tito to hospital for a scan on his neck, and prop John Yapp and wing Gareth Thomas were also hurt. Wales international Yapp suffered a torn biceps that will mean four months' sidelined, with wing Thomas facing up to six weeks out because of a torn groin muscle. "It was an expensive win for us in terms of injuries," said Young. "Paul Tito has gone to hospital for a scan following a bump to his head. He's not feeling too grand at the minute, but he is walking about and talking. A lot of our plans went out of the window because we had to rejig things too much. "When we get opportunities, we are still not scoring consistently. There have been two or three occasions this season when we have opened up a 10-point gap and then not kicked on." Northampton boss Jim Mallinder hailed Shane Geraghty as "a special talent" after his fly-half set up a stunning 31-27 Heineken Cup win over Munster at Franklin's Gardens. Geraghty scored 21 of the Saints' points and capped a superb performance in front of watching England manager Martin Johnson by stealing over for an opportunistic try late in the first half when he tapped and ran a penalty that Munster expected him to kick to goal. "We have seen Shane play at under-20 level for England and throughout the age groups and he is a special talent," Mallinder said. "What he has done today is to back up a number of very good performances for us this season and that is probably his best performance for us tonight. He made a lot of good options in attack, and he can see where space is whether it his passing or his running game, he's a real threat to defenders." But Mallinder declined to be drawn on whether Geraghty should be promoted from England Saxons squad to the elite squad. "That's a decision for Martin Johnson to make," Mallinder said. "Martin has got to decide whether he wants to play Shane and if so where. I have no hesitation in playing him in either position, at number 10 or 12." Edinburgh coach Rob Moffat has demanded his side sharpen up their act after gifting Stade Francais a 31-7 victory in their Heineken Cup clash in Paris. "We gifted them three tries and we did the same thing in the Magners League against the Ospreys last weekend. They (Stade) are a quality side but you can't afford to be 28-0 down and expect to come back and win games. "We have to make teams fight for what they get. Stade can flick the switch on and play quality rugby but they did not have to show sheer brilliance today, it was more down to our individual mistakes." Moffat bemoaned his side's preparations after his side were forced to travel to Swansea last Sunday and then the French capital inside six days. "We have to look at how we've prepared for this game. We had to play away six days before an away game in Europe and that is not ideal for us. It is not an excuse but it wasn't what we would have asked for. Leicester head coach Richard Cockerill believes that the Guinness Premiership's salary cap could soon affect English sides' competitiveness in Europe. Wage bills at Premiership clubs must be under £4m, with the big-spending French Top 14 sides and Welsh outfit Ospreys leading the way in terms of high-profile recruits. "If we are going to have a salary cap of £4m, the market place has got to be bigger," he told The Leicester Mercury. "If we want quality, we will have to pay for that and the squad will become smaller every year. We have 35 players in our squad this season. If the market place rises in value by, say 10% next season, we are going to have an even smaller squad next year. "If you are forced into playing kids in the Guinness Premiership because of wage constraints, it dilutes the competition and that would obviously be a concern." Clermont Auvergne's Canadian lock Jamie Cudmore has been banned for 20 days following his sending off against Perpignan. 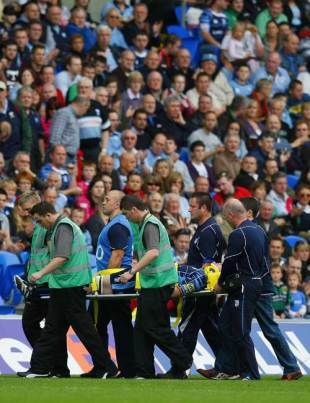 Cudmore saw red for a punch in the 19-3 defeat and will be unavailable for their opening European fixtures. Highly-rated Hawke's Bay fullback Israel Dagg has inked a deal which will allow him to play his provincial rugby for Hawke's Bay and continue his association with the Highlanders for next season's Super 14. Dagg, 21, said leaving Hawke's Bay was never a realistic option, but he had been weighing up his Super Rugby options. "With the Hurricanes well served with fullbacks and my wish to play as much Super 14 as possible, the Highlanders is the right choice," he said. "I enjoyed my time there last season and enjoy working with Glenn Moore and my provincial coach, Peter Russell." Griquas skipper Jonathan Mokuena has signed a two-year deal with the Golden Lions and will join up with them in November as preparations for the 2010 Super 14 begin. He will be joined by Bulls utility Marius Delport, who follows team-mate Burton Francis in signing with the Johannesburg-based union.